Want tosave 1,95 kn on this order and become Loyalty program member? Dutch Harvest hemp grew up in the far Groningen field in the Netherlands where the summer sun raises to reach an astonishing 3m in just 100 days! Hemp does not require spraying, improves soil structure and reduces the enormous amount of CO2. Tea does not contain THC. Tea comes in a biodegradable bag. 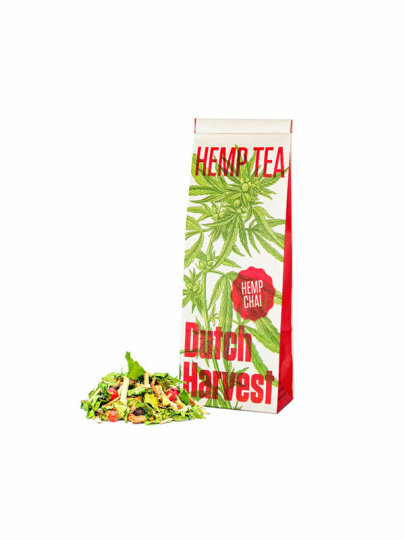 Try Dutch recipe for pure hemp infusion or one of the excellent blends. Clean as it was created by the mother nature, so there are no added aromas. Hemp Chai - Tea from hemp is inspired by Chai tea that originated in India, Nepal, Tibet and Pakistan. The word Chai is a common word meaning tea in these areas. Chai tea is mostly used in Ayurvedic medicine. Each region has its own recipe for Chai. Chai tea usually has a base of black or green tea, but hemp can also be the basic ingredient and make a tasty and specifically aromatic Chai tea. hemp (leaf, flower, seed) 60%, lemon grass **, grate **, cinnamon **, ginger **, parsley **, cardamom **, pink pepper **, sweet root **. Hemp Chai - Hemp tea has a full, powerful, spicy and somewhat sweet taste. Shake the bag briefly to make the tea ingredients stir well. Use 2.5 teaspoons of hemp per liter of water. Allow it to stay for 5 to 7 minutes. Galleria Internazionale d.o.o., Predavčeva 6,10090 Zagreb.